I only have a small house so I wasn’t looking for a humidifier that was extremely powerful, just one that I knew could provide my home with a good level of humidity and one that wouldn’t be too difficult to install. Fortunately for me, with the Aprilaire 350 I found what I was looking for. Since we got the Aprilaire humidifier I’ve noticed a big difference in my home. The humidifier we had before was, firstly, difficult to maintain and I frequently had to change parts and clean it. With the Aprilaire 350 I’ve not had to do this so much, which is great. Before I bought the Aprilaire 350 I was having some trouble sleeping and was snoring a lot, so my aim was to eliminate this and get a good night’s sleep. Once the humidifier is placed in the closet (or elsewhere), you face the backend to this room where it will connect up to everything it needs. The frontend will be facing into your home and provide the house with good, healthy air. As I mentioned before, the Aprilaire Model 350 Humidifier’s 0.50 gallons per hour evaporative capacity is not the most powerful on the market, but for the cost it works fine and, despite being low on the list, is still a trusty option if you’re looking for a humidifier. Aside from the ease of installation and upkeep, one thing I really appreciate about the Aprilaire 350 is the fact that it comes with a 5 year warranty. I’m not exactly gifted when it comes to work around the house, and so if it were to break I wouldn’t really know what to do. It’s important to note that this warranty is only applicable if you have an expert install the unit for you. The Aprilaire 350 is fairly quiet. Since I have it in my hallway I rarely notice the noise, though perhaps in your bedroom or living room it would be a different story. In any case, since it isn’t so powerful, the fans aren’t too loud. People looking for a powerful humidifier will want to look elsewhere. This will not manage to push air throughout a large home, but there’s no doubting it is a good, trusty humidifier that does the job in a smaller house. Since I got the Aprilaire 350 I’ve been much more comfortable in my home, and have enjoyed some great, undisturbed sleep! Allowing your child to get a good night’s sleep is essential for both you and them. These disguised humidifiers will help comfort your child through the night and ease their cold symptoms, dry throats, dry skin and more. These aren’t the most powerful humidifiers on the market, nor the most sophisticated, but for peace of mind and a healthy child, they do a great job. The Crane Animal Humidifiers range offers several different animals. You can choose from a pig, a dragon, a panda, an elephant, a penguin, a tiger and a frog, so whatever your child’s favorite animal happens to be, you can probably find a shape that will suit them. The mist is emitted from the animal’s ears. These humidifiers are ultrasonic, which means they use a vibrating plate that runs at a high frequency and breaks the water in the tank to vapor. Unlike other types of humidifiers, this process is virtually silent and so your child will have no trouble sleeping through the night. It also means that, unlike warm mist humidifiers, there are not any health and safety issues related to boiling water or burns. These humidifiers come with a 1 gallon tank that offer a 2.1 gallon output. This makes them suitable for smaller rooms of up to 250 square feet. They also have a demineralization filter cartridge that helps to reduce white dust, which can be bothersome for both adults and children. The real plus points of these humidifiers are that they cater to the needs of children. Their simple, safe design is perfect for a child’s room. They’re quick and easy to set up and very easy to adjust using the big knob at the front of the unit. These humidifiers can usually run for around 12 hours and feature an auto off function so you don’t have to worry about getting up in the middle of the night to refill it. Obviously if you are looking for a humidifier for a larger room or a main living space this is not the humidifier for you as it’s not powerful nor sophisticated. Indeed, you should be sure not to set the humidifier to emit too much humidity because without an internal humidistat it cannot control the level of humidity in the room. Too much humidity is also a bad thing, so be sure to keep your eye on it. Perfect for a child, this humidifier scores high on price, reliability, design and ease of use. It’s obviously not one for a large space or if you want to spruce up your room’s design with a sophisticated humidifier, but if you want to ensure your child has a good night’s sleep this will be the humidifier for you. For many children, dry air can be a problem, especially during winter months, and so the purchase of a child-friendly humidifier is a great idea to ease some of the symptoms that children can suffer from during winter. It is a welcome addition to any room with its sleek, jet black appearance. It can also emit either warm mist or cold mist, eliminating the need to choose between the two and meaning you get the best of both worlds. So, if you’re looking for relief from cold or flu symptoms, you can turn your PowerPure 3000 Ultrasonic Humidifier to its warm mist settings and get all the benefits of a regular warm mist humidifier. Similarly, if you’re looking for relief from allergies, or you simply want to keep a healthy balance of moisture in your room generally, you will benefit from the cold mist option. Another fantastic aspect of this humidifier is its range. It can fill large rooms comfortably (up to 700 square feet) and, best of all, without making noise. The PowerPure 3000 Ultrasonic Humidifier features a remote control which allows you to set your desired humidity levels in the room, while the LCD display screen lets you know the relative humidity levels and temperature. You can also set it on a timer. To save money on maintenance, the PowerPure 3000 Ultrasonic Humidifier boasts a permanent ceramic filter that cleans the water in your tank. For safety there is an auto shut off feature, so when water levels are low the humidifier will turn off. Thanks to its design, the PowerPure 3000 easily blends in and looks great in any room. It can humidify large rooms comfortably and operates almost silently, so it is perfect for anyone looking to purchase a humidifier for their living room, master bedroom or any other large room. The PowerPure 3000 Ultrasonic Humidifier is an extremely high quality humidifier. We believe it is one of the best on the market, and for all the features you get it is also extremely good value. The high quality production values mean it is economical to run and easy to maintain. If you have children, you will love the safety features of this humidifier, too. All in all, if you are looking for a humidifier that can help you get healthier, live happier and will look great in your home, this could definitely be the humidifier you are looking for. The Evap2 comes with an impressive five-year warranty. When set on high, the fan on this evaporative humidifier is quite loud. The Evap2 puts lots of moisture in the air and has a built-in humidistat, which is useful when setting humidity levels. The Vornado Evap2 is an evaporative humidifier that operates by pulling dry air into the device, moving the air through a large, wet, porous wick and then using a powerful fan to expel the resulting moisturized air. The Evap2 can convert two gallons of water into mist every 24 hours and works well in rooms up to 600 square feet. It can be set to run continuously, or the unit’s built-in humidistat can regulate the humidity levels in the room, turning the unit on and off as needed. On the highest setting, the fan on the Evap2 is louder than the other humidifiers on our lineup. Because the Vornado is an evaporative humidifier, it does not disperse the fine white dust that ultrasonic humidifiers expel when used with mineral-laden water. The Vornado also does not function as a warm-mist humidifier; instead, it works only as a cool-mist humidifier as it does not contain internal heaters to produce hot water or steam. That is good news for parents since it makes this humidifier safer for children and a good humidifier for baby than some other models. Warm-mist humidifiers can pose a safety risk if a child gets too close or tips over the humidifier. Because you can run the Vornado Evap2 as a fan as well as a humidifier, it does not have an automatic shut-off feature. Instead, when it is out of water, the stand-alone fan remains on with less risk of overheating. The sleek black and blue Vornado Evap2 is compact considering the amount of moist air it produces. It has well-lit display buttons that allow you to operate the controls in the dark. If you have it next to your bed at night, you do not have to turn on an overhead light to make adjustments. The Evap2 room humidifier comes with an impressive five-year warranty, which is the longest warranty of any humidifier we reviewed. If you encounter problems, you can check the device’s product manual on the company’s website. You also have access to a toll-free phone number or email support if you need help setting up, using or cleaning the device. 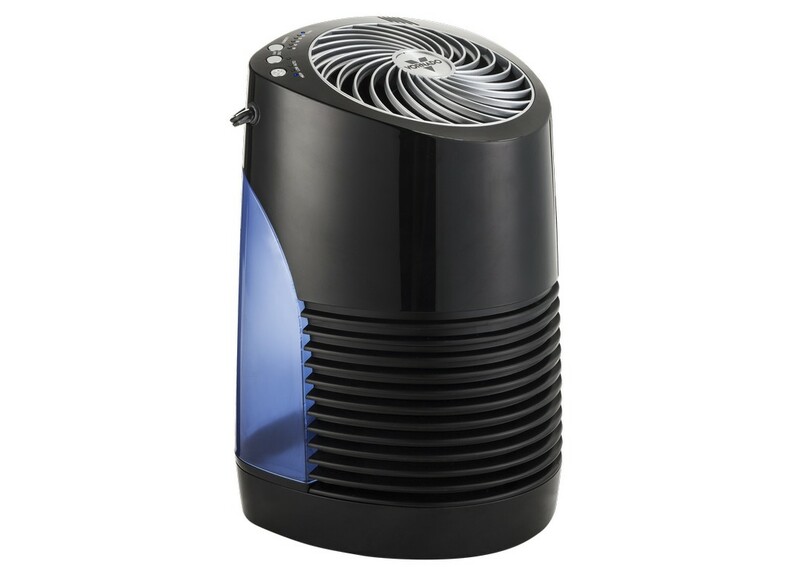 The Vornado Evap2 is a full-featured, evaporative-style humidifier that pushes out moist air with a powerful fan. Because it moves the moistened air out into the room so effectively, you can place it on surfaces like hardwood floors without the concern of damp spots collecting under the path of the mist. The high-speed fan also makes the unit noisy, and the lowest speed is the best option for sleeping. While it does not have an automatic shut-off feature, the unit moves safely from humidifier to fan mode when the water runs out. Safe, effective and clean, this is a good humidifier to keep your air humid. Installation was very straightforward and took very little time at all. I got a professional to install the unit, since otherwise the warranty that comes with Aprilaire products is not valid. He assured me, however, that it was a simple process and could have been done by myself. Previously, I have owned portable humidifier around my house. My hope was that with a whole home humidifier it would work out more economical in the long run, since I would not have to consistently replace parts. I also like the fact that I do not have to refill the unit daily or worry too much about mold and bacteria buildup. Aprilaire Happy making products to enhance the comfort of your home for over 50 years, and the name is well known in the industry. That fills me with confidence when I decided to go ahead and purchase one of their products. Compared to other humidifiers by the same company, this one is slightly more economical and does not have quite the range of, say, the 700M. That’s fine if you have a smaller home, like me. The Aprilaire Model 500 is great value, costing around $160. 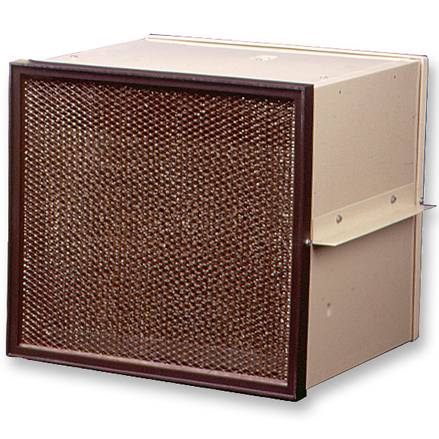 It comes with a built-in bypass damper, meaning there are less parts to install than in other Aprilaire Model units. It comes with fully automatic control, though you can also choose to modify settings and run it manually, if you would prefer. This humidifier has a .50 gallons per hour evaporation rate, which is perfect for a home that is not too big. The great thing about this humidifier is that microbial growth is prevented. the dream through technology in the humidifier leave no standing water once the humidifier turns off. That means all the water that goes into the humidifier either evaporates or goes down the drain. Since, that for, the water does not stay around for an extended period of time it is extremely unlikely that mold can grow. Another bonus is that you will only have to attend to the unit annually, which, as I mentioned, was a big problem for me when I used to own portable ultrasonic humidifiers. I was often forget, and this would lead to microbial build up inside the unit. 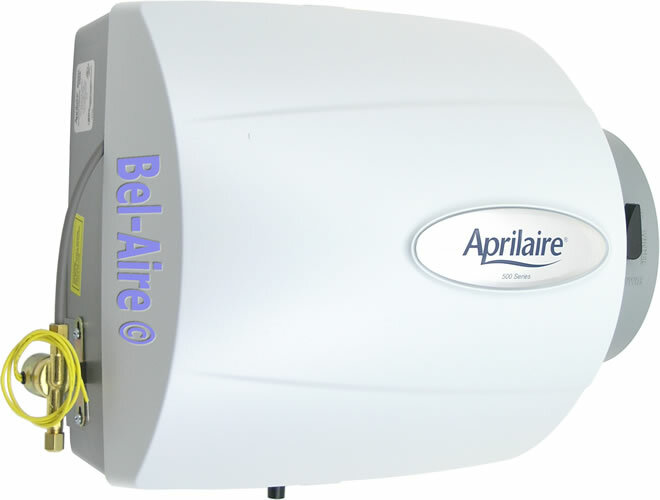 I think you can’t really go wrong when purchasing an Aprilaire humidifier, and the 500M is an economical and reliable unit that has being a great addition to my home. It is cheaper than some of the other products, which is fine if you are not looking for something complicated or more powerful. I got kind of fed up with my old humidifier because I kept having to replace the filter every month or so, and so I was looking for a humidifier that wouldn’t require me to do this. I only need a humidifier for a small area since I just use it in my office when I work from home. Shopping around online is an arduous task but fortunately, eventually I came across the PowerPure 2000 Ultrasonic Humidifier. This is a contemporary humidifier that looks great in any room. It is small, easy to carry around, and offers premium features that will increase the comfort of the air in your home. I really love the way the PowerPure 2000 Ultrasonic Humidifier looks. It has a unique design that I’ve never seen before, and my friends when they pop over always comment on how neat it looks. It’s also very compact which makes it easy to carry around – another bonus I was looking for. But beyond the way it looks, this is a very able little humidifier. It emits up to 1.75 gallons of moisture a day and can fill a room of up to 300 square feet with humid air. This humidifier comes with a hygrometer and so you simply have to decide upon your preferred level of humidity on the LCD screen and the PowerPure 2000 Ultrasonic Humidifier will do the rest for you. 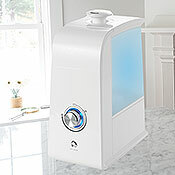 I would say this humidifier is really perfect for a bedroom or small office as it is very quiet to run. As mentioned, I love the fact you don’t need a filter with this humidifier since that was a pain for me before. PowerPure 2000 Ultrasonic Humidifier has a permanent ceramic filter that softens and cleans the water before it is emitted. It comes with a timer, a nightlight (which means it’s also great for children’s bedrooms – as does the very funky design) and an auto shut off feature, so you do not have to worry about the unit getting burnt or damaged when it runs out of water. Once a month you will have to empty the tank and wipe it down, but it shouldn’t take long and that’s really the only maintenance this unit needs. For its size I found the PowerPure 2000 Ultrasonic Humidifier packs quite a punch and I’ve noticed a discernible difference in the quality of the air in my office. This unit is not meant to be on the floor, so I keep it up on my desk and since it looks great there’s really no issue with that. I love the translucent orb shape of the unit and the bright LCD panel, it makes this excellent humidifier look like something from the future. For anyone, like me, that doesn’t like cleaning and maintaining their humidifier, the PPowerPure 2000 Ultrasonic Humidifier will be one of your favorite purchases of the year. All the benefits of a great humidifier without any of the annoyances. I was looking for a humidifier for my child’s room because she has not been sleeping well recently. I had read an article in a magazine that said purchasing a humidifier for your child can be a good idea to help soothe their throat and so I went ahead and did my research and bought the Vicks Vul520 Filter-Free Cool-Mist Humidifier in pink. What’s great about this humidifier compared to the one we have downstairs in the living room is that it has no filter. That means we never have to replace the filters or worry about them clogging up with bacteria that our child could breathe. The Vicks Vul520 Filter-Free Cool-Mist Humidifier also has an integrated Scent Pad Heater, which means you can use the Vicks VapoPads with it. We use these pads at night for our child and it’s helped enormously. The tank on the Vicks Vul520 Filter-Free Cool-Mist Humidifier will operate for 10 hours and holds half a gallon of water. When the tank is empty the machine automatically shuts off, which is great since it means it won’t burn out or get damaged. It’s also very easy to clean and extremely easy to move around, so if your child wants to sleep in your room for the night you can just pick up the humidifier and bring it with you. While not complicated or bustling with features, the Vicks Vul520 Filter-Free Cool-Mist Humidifier is a very safe, reliable humidifier that has the added benefit of using no filters. It is also fantastic for congest sinuses, blocked noses, allergies, asthma and more. Of course, there is no cure for the common cold but you can do every little thing you can to help your little bundle of joy from getting one, and this humidifier is a great start to helping them breathe easy. If your child does have a cold, the use of the Vicks VapoPads will help greatly with making the experience less painful – and noisy – for everyone. The Vicks® Vul520w Filter-Free Cool-Mist Humidifier, mini, is wonderful for congested sinuses and nasal passages, coughs, allergies, and asthma, and humidifiers are recommended by the American Academy of Pediatrics. Doctors know that there is no cure for a cold, yet there are things you can do to make your baby, children, and others feel more comfortable when they have congestion. 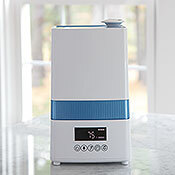 For a better night’s sleep and to feel more relaxed because your breathing is easier, a humidifier is the way to go. We have had a number of humidifiers in our home to try and combat the dry air. We live in Wisconsin so the air gets pretty dry in the winter from the furnace running all of the time. After some bad luck with units purchases at the local hardware store, I decided to buy one online. After reading some of the other reviews, I was a little hesitant to purchase this unit (in regards to leaking and humidifier monitor issues). However, after we got this unit and started using it, we absolutely LOVE it! We have not experienced any of the issues that the other reviews mentioned. The humidity monitor works great, and is a very nice feature. Although we have a ceiling fan running all the time so that probably helps circulate the humidity around the room. Our last unit actually did leak right out of the box, but this one is perfectly clean. The spout works great, and the water compartment is easily removed for fillup. It’s very quiet, so won’t keep you awake at night either. If there was a negative, it might be that the water output is not that high, but I don’t think ultrasonic units have as much output as heating units. Everything else has far exceeded my expectations. I highly recommend it. Because the humidity is not distributed upwards, but at an angle instead, it sprays the raised silver top of the tank with moisture which then needs to be cleaned up. Might as well be leaking from the tank, what a pain. This unit also has an inaccurate humidity sensor. Because it humidifies the air directly around the unit, a room with 30% humidity is suddenly detected as 60% humidity after the unit runs for a short time, causing the unit to prematurely switch off. You’ll have to override this by setting it at “always on”, but the sensor still displays the inaccurate reading which is therefore a reminder every time you look at the unit of how it’s not functioning as designed. Because the tank is so opaque from dark tint, it’s very hard to see the water level and how much is left. The tank doesn’t hold as much water as other units on the market, and the handle placement makes it awkward to hold while filling. I previously owned the Holmes ultrasonic model, which was a great unit except that it was a pain to clean. I figured this Bionaire unit, which was $20 more and looked cool, would be easier to clean. After opening it up, it looked more difficult to clean. Returning this to Target and going with the Holmes.